The Brownies meet each Wednesday evening during school term at 6.00 pm in the Community Hall. It is over 30 years since the 50 Club was formed. As its name suggests, it had 50 members each paying £12 per year. As the village has grown the membership has increased. At a time when there were 80 members the club changed its name to the 80 Club. Now, despite the Committee’s decision to increase the annual subscription to £20, we have over 115 members. The 80 Club not only gives you the chance of winning some grand prizes but you also benefit from the donations made annually to your Parish Church and Community Hall. In 2009 the total was £834 divided equally between the Church and the Community Hall. Short Mat Bowls is a game that can be played by virtually anyone. The youngest players are aged about 14 and the eldest in their 70’s. 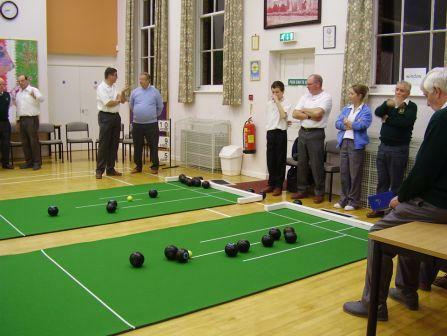 Tarrington Short Mat Bowls team has an average age of 45 years old. We invite you to come and join us for an evening just so you can see what a great game this is. You need patience, co-ordination and perseverance. The game appears remarkably simple but like all bowls, it is in fact remarkably skillful. It takes a lot of practice and quite a long time before players can actually get the woods to do what you really want them to do. Tarrington SMB team practice throughout the summer on most Mondays (excluding 2nd Monday of the month) at the Tarrington (Lady Emily) Village Hall. Practice starts at 7.30 pm and finishes at 10.00 pm and we have a break for tea/coffee and biscuits about 9.00 pm. If you’d like to come and try this wonderful fun game, please ring Veronica Hodges on 01432 890431 so we know to expect you. It’s more difficult than it looks but most individuals can get the hang of it quite quickly although it may then take a long time to develop real skill. Club meets on Tuesdays in the Community Hall, from 11.00am to 3.30pm. Members can attend for the whole period or for part of the time, as they wish. The members cover a wide range of crafts, depending on materials available and inspiration from each other! This club started 30 years ago, and some of our founder members, now in their late 80s and early 90s are still attending. We have a group of helpers who are drivers and cooks! We meet on the first Wednesday of every month to have a two course luncheon followed by some entertainment or group activity. 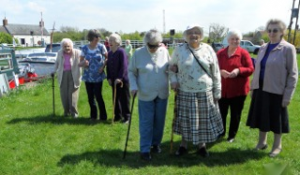 Many of our members have known each other as fellow workers or neighbours, but as they have aged have had to move away , perhaps to sheltered accommodation. Volunteers collect those that need transport and bring them along to The Lady Emily Community Hall. Others who live alone in surrounding villages look forward to the monthly meetings with their old friends. During the summer, we have various trips around the West Midlands or to Wales—and we welcome those who are disabled too. We would be happy to hear from any retired person who would like to join us at our monthly ‘get-togethers’, please contact Jeanette Forrester 01432 890440 or Jan Pierce 01531 634904 for more information.